It is a violation of Facebook Terms to use your personal profile to represent something other than yourself, such as your business. And recent Facebook changes have made it more challenging for businesses to market on personal profiles. Importantly, Facebook no longer allows 3rd party applications, which are widely used by businesses, to post to personal profiles. In general, Facebook is trying to encourage businesses to use pages for these purposes, rather than using their profiles. Considering that Facebook Pages are far more useful than personal profiles for businesses, this change is a welcome one. While shifting your business marketing focus from your personal Facebook profile to a Facebook Page may be anxiety inducing, there are many good reasons to do it. Facebook has altered its platform for third party applications, in particular. Third party applications can no longer post to Facebook profiles on behalf of the user. Facebook clearly rejects any strategy involving businesses using personal profiles for marketing purposes. So while automated posting to Profiles is going away, Facebook will continue to support automation to Pages and Groups. Facebook is continuing to encourage tools that help users manage and automated their business tasks. Business users. That being the case, we must look at the reason that Facebook believes that Business users need Pages and Groups more. Personal Profiles are geared toward helping individuals share personal details and connect with their friends and family. It provides opportunities to post to your friends, add your job title, and add your education. Nowhere in a Profile are you able to indicate a business entity. This represents a very intentional move on Facebook’s part. What does Facebook have to say about this? Facebook actually actively discourages using a profile to promote your business. Using your profile to represent your business is against Facebook’s terms of service, and could cause you to permanently lose access to their platform. This risk is definitively not worth losing all the hard work on your profile anyway, and all it takes is one report on your profile to make that happen. The place that you can indicate a business entity is a Facebook Page. A Facebook Page and/or Group can help your business build its identity, rather than building a person’s identity. Your Facebook Page offers features that help your business hone their Facebook success, with Analytics built right in. With all these features available, Facebook makes your Business Page a great environment in which to operate. Groups exist to market to your user base as well. A group can be set up to address a specific group of people, or a specific topic. As an Administrator of a group, you can set the topics and enforce rules of the group. Groups are a great way to facilitate conversation and market to your desired consumer. By setting up a categorized group, or a group that talks about a specific product, you can find those people on Facebook who would be interested in your product. For example, if you have a company that sells cat toys, you may create a group that appeals to pet parents. This is a great way for people to discuss their favorite cat products, their pets, and tips for caring for their pets. This being the case, you, as the marketer, have a great opportunity to slip in your marketing opportunities among the discussion. Why should I post to Facebook Pages and Groups instead of to my personal Facebook profile? Personal Facebook Profiles are intended to be for a person, not a business. In making a profile gear toward your business, you are actually performing a disservice to your business. You are limiting the reach of your business to just that of a profile. When you use a Facebook page, you are opening up a lot of opportunities for yourself, including a very powerful suite of Analytics, along with opportunities to implement calls to action and purchase Boosts for your posts. A call to action on Facebook allows you to connect your customers directly to your resources. You may choose to connect a messenger, a website, a shopping page, or a contact us page. Any call to action option provides a valuable opportunity for interaction with a new or existing customer. What are the analytics that I can access? Facebook’s analytics are incredibly robust because of the wide variety of activity that is encouraged on Facebook. For your business pages, you can analyze timing of your posts, likes of your posts, reach of your posts, and engagement on your posts. The most valuable analysis that Facebook provides is the analysis of when your followers are online. On a platform like Facebook, timing is everything. Many social media marketers want to know the ideal time to post to their timeline, and there are best practices for other social media platforms, but Facebook actually puts this info right in front of you. Businesses can take advantage of so many opportunities through their pages and groups that simply aren’t available on a personal profile. Facebook’s analytics tools aren’t available for personal profiles. They won’t tell you when to post on a profile, but they will absolutely do this on your business page. Why is a profile a bad idea for my business? When you’re using a profile, you’re giving up your business identity. Because profiles are geared toward individuals (and should ONLY be used by individuals), you cannot place your business name front and center. In fact, again, this is against Facebook’s terms of service. Your business identity cannot be part of your profile when you’re using Facebook. Remember that using Facebook is meant to promote your business. If you’re trying to do that on a personal profile, you are risking losing your access permanently. Rather than putting all that work into a personal profile, put your efforts toward making your business page more robust. Put your energy into building this out so that your page can become verified. The verified badge helps users understand that this is your official page. Getting your page verified by Facebook is a great way to generate an air of legitimacy about your business. Unfortunately, this badge will not appear on a profile if you are trying to use it for business. What’s difference between posting to personal Facebook Profiles and Facebook Pages when it comes to SEO? 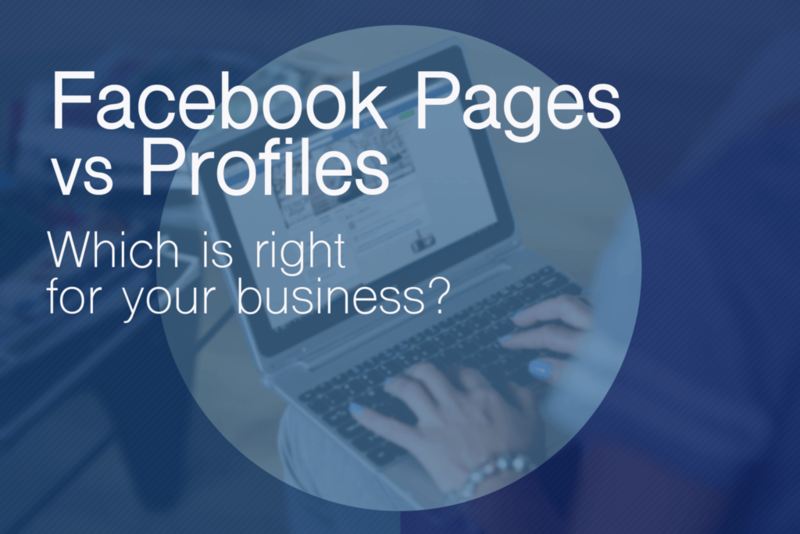 Within profiles, some choose to use their Facebook bio for SEO reasons. However, while this is a great addition to help with SEO, it isn’t necessarily the best tool to communicate about your business. Your page will allow you to build a complete profile for your business. Facebook has outlined a process to set up your page for your business. Within that process contains information about how to set up a call to action. This may not seem like an important detail, but it is the one part of the process that can convert into money for your business. A call to action can direct your customers into your website where they can make a purchase. This source of conversions provides the best possible chance you have from Facebook to get your business page to bring in money for you. Not to worry. Facebook has already thought of that. There is a section of Facebook that will allow you to convert a profile into a page. Rather than losing all that work that you’ve put into the profile, you can retain all of that work. You won’t be losing any of the SEO that comes with your profile content. A lot of businesses also worry about having people find their new page. There are actually a number of tools that can help with that. For example, Facebook’s people search tool can help. Of course, Ads may be the best solution for your business, but that’s a whole other post. Not only will you be able to convert the profile into a page, you will also be able to add the friends into the page’s followers. Profiles may be a great short term tool, but for the long term, a page is the better option. How do I complete this conversion? With the conversion process, you will not be losing any of the information associated with the profile. The one thing that is lost in the conversion is the metrics associated with your posts. In the end, though, page insights are much more helpful for the analytics they provide. Conversion also presents an excellent opportunity for page cleanup. Facebook allows you to select the content that you want to transfer. If you have information associated with your profile that no longer applies, you can simply choose to ignore it in the conversion. Beware, though, as the conversion cannot be reversed. If you want to convert, this will be a permanent page, and your profile will be gone permanently. This is not a bad thing, but it is important to remember that this is a permanent process, so save what you must while you’re converting. What happens after my conversion is done? Once you’ve completed the conversion process, a couple of things will happen. First, your friends from the profile receive a notification that you’ve created a new page. They will then have the option to become a follower of that page. If you choose that friend to follow your new page, they will automatically be removed from following your profile and will transition into a follower of your page. If your profile contained verified status, that verified status transfers over to your page as well. Facebook also automatically takes care of transferring your profile and cover photo, so you don’t have to worry about that. You also have the opportunity to preview the changes before making the page live. Facebook wants your business to be successful, so they provide tools that help your business succeed. When you’re using a profile, you’re ignoring those finely tuned tools that Facebook has spent a lot of time and effort researching and implementing. Understandably, many business owners are wary of these types of tools, but I promise, it is worth it to use these options. The call to action alone is an invaluable tool for your business. In the end, Facebook pages are simply a better option for most businesses. Really impressive details regarding facebook page and facebook profile. Few things I really didnt know about it and i am gonna improve my skills for sure. Thanks for the great information. One thing I don’t like about FB pages is that you cannot share there posts as a “page”. You can do it only as a person. Unless I’m overlooking something.